Do you suspect some traffic sources are not getting the rewards they deserve? Do you want to know how much credit each of your marketing channel actually gets? When you look at which referrers contribute the most to your goal conversions or purchases, Matomo (Piwik) shows you only the referrer of the last visit. However, in reality, a visitor often visits a website multiple times from different referrers before they convert a goal. Giving all credit to the referrer of the last visit ignores all other referrers that contributed to a conversion as well. You can now push your marketing analysis to the next level with attribution modeling and finally discover the true value of all your marketing channels. As a result, you will be able to shift your marketing efforts and spending accordingly to maximize your success and stop wasting resources. In marketing, studying this data is called attribution modeling. Attribution is a premium feature that you can easily purchase from the Matomo (Piwik) marketplace. You probably have hundreds or even thousands of different sources listed within the referrer reports. We also guess that you have the feeling that it is always the same referrers which are credited of conversions. Guess what, those data are probably biased or at least are not telling you the whole story. Why? Because by default, Matomo (Piwik) only attributes all credit to the last referrer. It is likely that many non credited sources played a role in the conversion process as well as people often visit your website several times before converting and they may come from different referrers. This is exactly where attribution modeling comes into play. With attribution modeling, you can decide which touchpoint you want to study. For example, you can choose to give credit to all the referrers a single visitor came from each time the user visits your website, and not only look at the last one. Without this feature, chances are, that you have spent too much money and / or efforts on the wrong referrer channels in the past because many referrers that contributed to conversions were ignored. Based on the insights you get by applying different attribution models, you can make better decisions on where to shift your marketing spending and efforts. Once you apply different attribution models, you will find out that you need to consider a new list of referrers which you before either over- or under-estimated in terms of how much they contributed to your conversions. You probably did not identify those sources before because Matomo (Piwik) shows only the last referrer before a conversion. But you can now also look at what these newly discovered referrers are saying about your company, looking for any advertising programs they may offer, getting in contact with the owner of the website, and more. Last Interaction: the conversion is attributed to the last referrer, even if it is a direct access. Last Non-Direct: the conversion is attributed to the last referrer, but not in the case of a direct access. First Interaction: the conversion is attributed to the first referrer which brought you the visit. Linear: whatever the number of referrers which brought you the conversion, they will all get the same value. Position Based: first and last referrer will be attributed 40% each the conversion value, the remaining 60% is divided between the rest of the referrers. Time Decay: this attribution model means that the closer to the date of the conversion is, the more your last referrers will get credit. Those attribution models will enable you to analyze all your referrers deeply and increase your conversions. 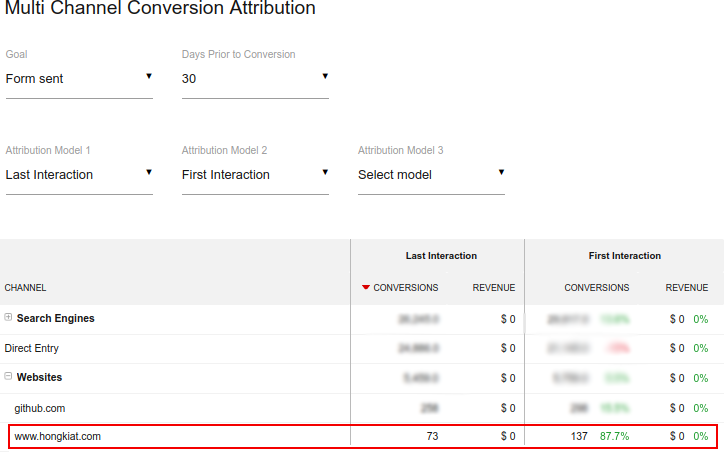 Here it is interesting to observe that the website www.hongkiat.com is bringing almost 90% conversion more with the first interaction model rather than the last one. Attribution modeling in Matomo (Piwik) does not require you to add any tracking code. The only thing you need is to install the plugin and let the magic happen. 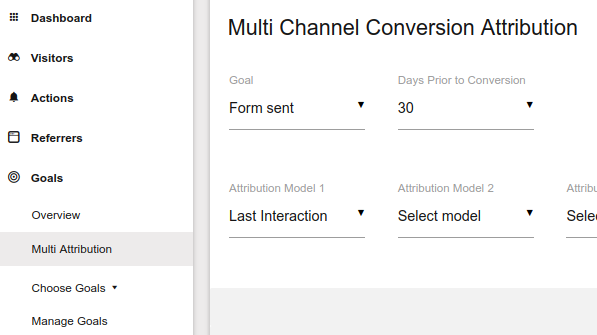 There you can select the attribution model you would like to apply or compare. Attribution modeling is not just about playing with a new report. It is above all an opportunity to increase the number of conversions by identifying referrers that you may have not recognized as valuable in the past. To grow your business, it is crucial to identify the most (and least) successful channels correctly so you can spend your time and money wisely.